Visite en petit groupe, nous étions 6 personnes au total ce qui rend cette journée encore plus agréable. Alex le pilote et guide est super sympa, très pro. Les lieux visités sont réellement inévitables quand on est dans la région de Porto. Une très belle journée. J'ai beaucoup aimé Braga, j'aurais aimé avoir plus de temps libre à Braga car c'est charmant comme tout. Guimaraes est chargé d'histoire. Très intéressant. It was just myself and one other couple on the tour. Hugo was very knowledgeable and an easy conversationalist. It was so easy being picked up from the hotel and a no fuss way to see two beautiful places. Charming host/driver David(e ? ), very interesting places and good included lunch, even managed to walk up the steps to the church in Braga...... so could take advantage of the lunch without feeling guilty. An excellent day our and tour. The two guides were great fun and very informative. Lunch was amazing too. Excellent trip with an excellent guide. Do this one as you go round the castle and ducal palace in Guimaraes, some dont. Lunch was excellent, very much enjoyed with the small group. All we needed was half an hour longer to explore guimaraes. Pedro was our guide for the day and Hugo was in training. It was a very relaxed and comfortable tour. Both guides were very knowledgeable and Pedro kept us informed about the day and what we could expect. Our free time was sufficient and lunch was a true Portuguese experience. We were not hurried in any way and on our return to the city Pedro mentioned the clock above Fnac building. He dropped us close on our return and we got to experience the clock and its figures, which we would never have known about. Thankyou Pedro and Hugo for an awesome experience. The Tour was great, the guide Luis has given a lot of interesting information. 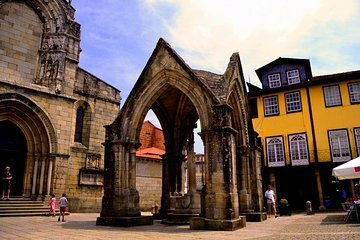 Both Braga and Guimaraes are the gems of Portugal. It was a very thorough tour to all of the. Air highlights of Braga and Guimarães. All of the entry fees were included. Also a very good lunch is provided at a local restaurant. Paula was our guide and she did a wonderful job interacting with all of us and provided a very informative narrative to all the different sights. I felt lucky that we had her as our guide.